Pitch positions haven't changed, the notes are on staff lines in the same position as in traditional notation. Each pitch also has a unique symbol with its own mnemonic “helper” word that describes it. 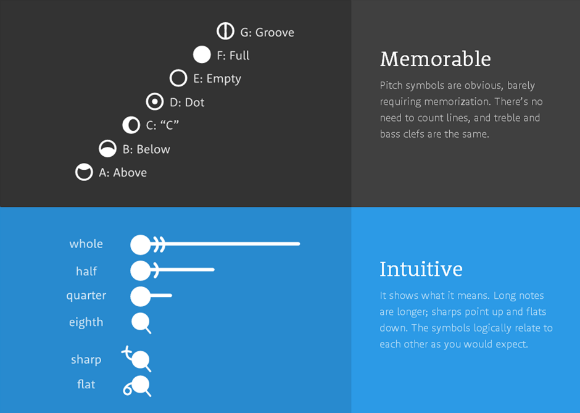 Pitch symbols are the same for all clefs and octaves. Sharps point up and end with a + sign; flats point down and end with a 0 sign. To avoid confusion, accidentals connect directly to the note and are visible every time they occur. When it helps, naturals can be used too, and they look like = signs. Each rhythm and rest has a unique symbol. The horizontal lines for quarter, half, and whole notes extend for distances that correspond to their durations. The precise lengths may differ to allow better formatting, but within each measure they maintain correct relative proportions. Read more in the offered guide here. Hummingbird according to its creators is "a fresh take on music notation, that is easier to learn, faster to read, and simpler for even the trickiest music." Check out the video above and try it for yourselves.